One of the most troubling aspects of Christianity at the end of the twentieth century on into the twenty-first century has been the bifurcation of God’s sovereignty and man’s free will. There has been a tendency among modern Christians to view God as some sort of “Cosmic Genie” who grants us all our wishes – if we have enough faith. However, the Bible presents a different picture of God. He is a God who cannot be manipulated or controlled by Satan – let alone puny little human beings. God’s soverein nature and character needs to be heeded if we are to take the Scriptures and the Christian life seriously. In this short book (five chapters) John MacArthur makes a clear case for God’s sovereignty and clearly articulates what that means for our salvation and sanctification. In this book you will get a clear picture of the holiness of God and how His greatness. There is no juxtaposition between His holiness and justice. Because God demands and requires righteousness from His subjects he shows the necessity of Christ’s life, death, and resurrection on our behalf as the sole reason for our salvation. Personal salvation demands repentance and faith in a sovereign and Holy God who requires nothing less than our submission to His Lordship in all of life. MacArthur clearly articulates who God is, who we are, and how salvation and sanctification manifest themselves biblically in our lives. 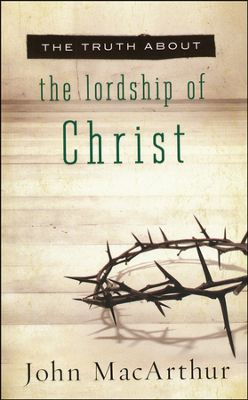 I recommend this book especially for new Christians who haven’t read a lot of theology or have the time to commit to lengthier treatments on God’s sovereignty, His salvation, or how we can live the Christian life (sanctification). *This book was given to me free of charge by the Booksneeze Program and I was not required to write a positive review.